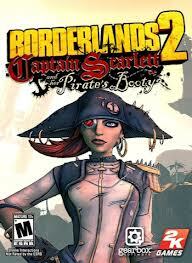 A new DLC for Borderlands 2 is coming called Captain Scarlett and Her Pirate's Booty. It adds not only more missions, but also a new form of currency called seraph crystals. This new currency allows you to purchase special seraph weapons that vary in rarity like traditional weapons. When is it going to be released? The date is October 16th, 2012! It will cost $9.99. Get it from the usual places -- Xbox 360 Live Marketplace (XBL / XBLM) or the PlayStation 3 (PS3) Network / PSN. It *SHOULD* also increase the level cap of the game, as was done traditionally in the past -- possibly bringing the level cap to level 60 or level 55 or something like that.